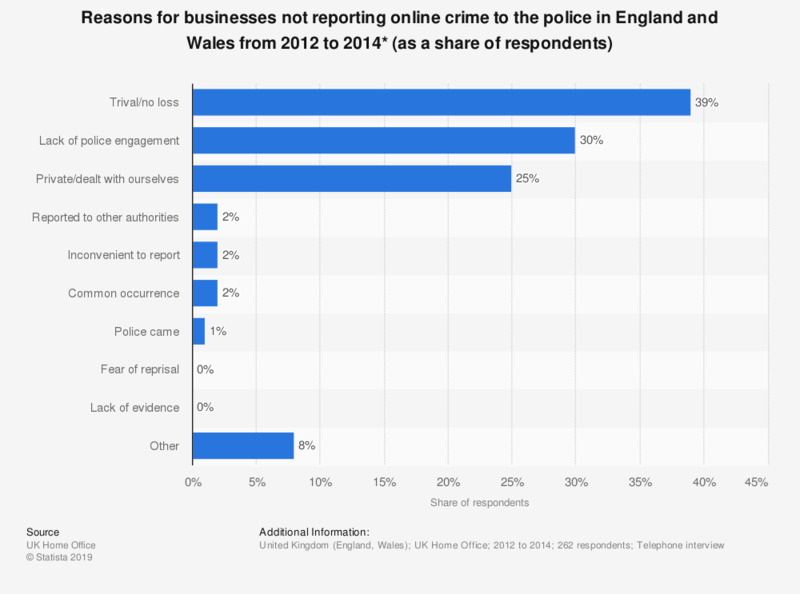 This survey shows the reasons businesses across 6 industry sectors gave for not reporting cases of online crime against them to the police in England and Wales in the years from 2012 to 2014. Of respondents, 39 percent claimed they did not report the incident as the crime was trivial and/or there was no loss. * Data is based on responses from across 6 industry sectors: agriculture, forestry and fishing, wholesale and retail trade, accommodation and food services activities, arts, entertainment and recreation, manufacturing and transportation and storage industry sectors. 'Lack of police engagement' as defined by the source includes "police could not have done anything; police have not done anything in the past; police would not be interested; and tried to/was unable to contact police." 'Police came' as defined by the source includes "police came automatically/responded to an alarm; and someone else reported the incident"
'Other' as defined by the source includes "it's not a crime/it's just something that happens; legal system not able to deal with this type of incident; there was no insurance requirement; would increase insurance cost; crime was committed in another country; realised too late after the incident/too long had passed; recovered/retrieved/returned goods/money; fear of negative publicity/impact on reputation of business; didn't want to report it to the police; thought it was our own fault; didn’t give this a thought/know we could/had to report it; still investigating/looking into this; don't know/can't remember; and other." Statistics on "The police service in the United Kingdom"